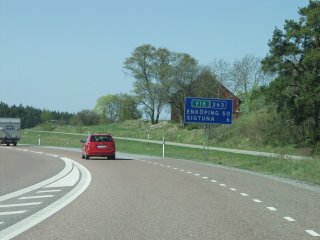 Nääs is located 30 kilometers east of Göteborg, also called Gothenburg, Sweden, along highway E-20. 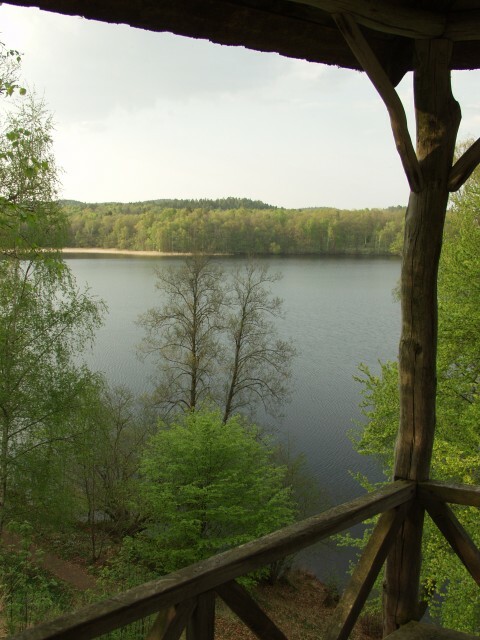 The name Nääs, pronounced "Ness" means peninsula, and as you might guess takes its name from its location on a large lake. The castle at Nääs is surrounded on 3 sides by water, and the original stone castle perched on high ground overlooking the lake was the site at which one of the various Danish invasions came to a halt, with a group of Swedish patriots fighting the Danish King and an army of 10,000 men. The site is interesting even if you aren't interested in Sloyd. 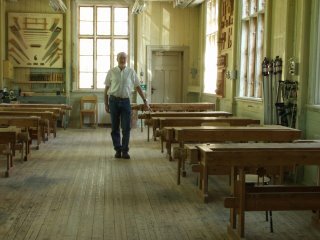 The original buildings of the Sloyd Seminarium are carefully preserved and the home of August Abrahamson, Otto Salomon's rich uncle is preserved with all the original furnishings of the late 19th century still in place. He had stipulated in his will that the castle be kept as it was the day he died, and except for dusting, cleaning, and maintenance it has been. He left a sizable property that is managed by the August Abrahamson Foundation to insure its preservation. 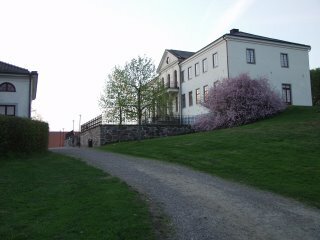 Today, Nääs serves as a conference and retreat center, as well as being an interesting tourist site. A map showing the location of Nääs is above. Below are a view of the lake, and photos I took of the interior of the castle. Shown are the servants dining area in the basement and August Abrahamson's desk, complete with desk accessories made in the Sloyd Seminarium. 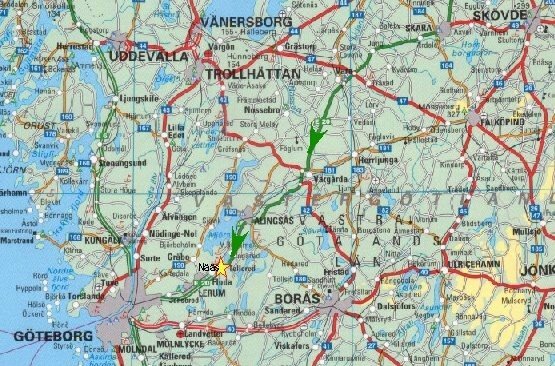 A visit to Nääs... While educational sloyd was first created by Uno Cygnaeus in Finland, Otto Salomon in Sweden was largely responsible for developing it as a more systematic means of education, and was responsible through his teacher training seminary at Nääs for its world-wide distribution. For the next few days, I will take you on a visit to Nääs. When I first learned of Educational Sloyd, I became interested in the Sloyd Seminarium at Nääs and learned that while it no longer functions as a school for sloyd, it is preserved very much like it was and is still a center for the Home Sloyd movement in Sweden. I planned for several years to visit and then in May 2006, I was able to spend 3 days in Nääs on my way to the First International Conference on Sloyd at Umeå. Sweden is incredibly beautiful in May, with fresh green fields and blue skies. 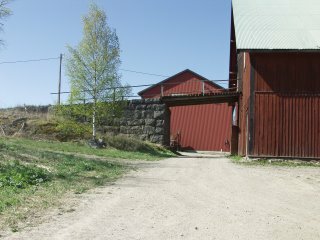 The red color of the homes and barns is a deeper red than is used in the US. But for that small difference, a drive through the Swedish countryside is very much like a drive through Wisconsin or Minnesota. 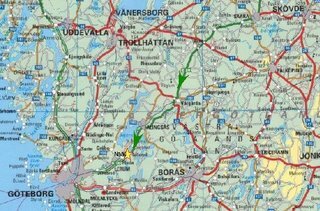 We landed in Arlanda airport outside Stockholm, spent the night in a hotel and then drove nearly across Sweden to Nääs in one day. The first photo above is of one of the original sloyd rooms in the Sloyd building at Nääs.The last photo is the Slott or castle home of August Abrahamson, the uncle of Otto Salomon and the Swedish merchant who provided the financial resources for the school to operate from 1870 to 1960. 1. To instill a taste for, and a love of labor in general. 2. To inspire respect for rough honest, bodily labor. 3. To develop independence and self-reliance. 4. To train in habits of order, exactness, cleanliness and neatness. 5. To train the eye and sense of form. To give a general dexterity of hand, and to develop touch. 6. To accustom to attention, industry, perseverance, and patience. 1. 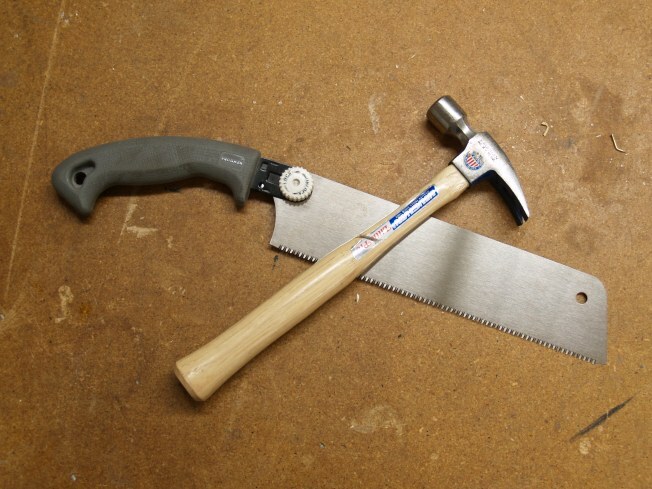 To directly give dexterity in the use of tools. What exactly are we teaching in schools today? It might be worthwhile to consider our objectives and determine whether our methods promote the values we hope our society will reflect. 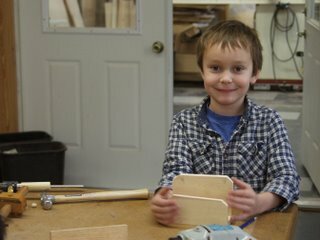 Earlier in the school year... all the Clear Spring School students from 1st through 8th grades made percussion instruments in woodshop. This last weekend, they had public performances in the City Auditorium and in Basin Park in downtown Eureka Springs as part of the Eureka Springs 59th annual Folk Festival. 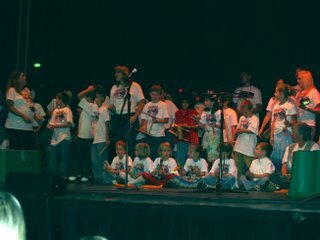 The photos above are the Clear Spring students in the City Auditorium performing "Some Houses." The photo below shows the various instruments made in the Clear Spring woodshop. Shown clockwise from the front, sanding blocks, 1st and 2nd grades, rhythm sticks, 7th and 8th grades, tongue drums, 5th and 6th grades, another rhythm stick, 7th and 8th and thing-a-ma-jigs, 3rd and 4th. Hands in education resolution... About a year and a half ago, I attended a conference at Ford Motor Corporation in Dearborn, MI in which hands in education experts from around the US met to discuss strategies for putting hands-on education back in schools. Following that meeting, and with the purpose of gathering momentum for the cause, I wrote the following resolution and asked the National Association of Home Workshop Writers to endorse it at their annual meeting. We, members of the National Association of Home Workshop Writers (NAHWW), adopt hands-on education in our nation's homes and schools as our organization's public service mission and imperative. We regard the use of the hands in education as being an essential requirement for engaging the passions of our children and youth. We acknowledge the importance of learning through use of the hands for bringing forth the inherent wisdom of each individual. We challenge our nation's schools and communities to create and sustain programs of manual training and the arts for children of all ages. The resolution was passed unanimously both at the annual meeting in Las Vegas, and then by a post meeting polling of the board members not in attendance. Other organizations are welcome to join us in this effort. Getting real...Sometime back in the late 1700’s a child in Pestalozzi’s school challenged his teacher, “You want me to learn the word ladder, but you show me a picture. Wouldn’t it be better to go look at the real ladder in the shed?” The teacher was frustrated by the child’s remark and explained that he would rather not take the whole class outside the building just to look at a ladder. Later, the same child was shown the picture of a window and again interrupted the teacher. “Wouldn’t it be better to talk about the window that is right there? We don’t even have to go outside to look at it!” The teacher asked Pestalozzi about the incident and was informed that the child was right. Whenever possible children should learn from the real world and the experiences it offers. I doubt that you could find any educational theorist who would disagree with Pestalozzi on this. We can follow the long line of theorists from Commenius, Rousseau, and Froebel, through William James, John Dewey and Howard Gardner. But still, in schools, we create artificial learning environments for our children that they know to be contrived and undeserving of their full attention and engagement. There are distinct differences between the academic life and the real world. I can remember being asked when I was a college student, “What are you going to do when you get out in the real world?” There is knowledge shared by students at all levels that the school world is unreal. There are noted and important differences between sheltered and contrived learning environments and the multidimensional reality beyond the classroom doors. The greatest problems in modern education can be summarized in the 3 Ds: Disengagement, disinterest and disruption. Schools often fail to engage children's innate capacities for learning. In worst cases, students become disruptive of the educational interests and needs of others. At a very early age, children are instructed, "don't touch!" "Keep your hands to yourself!” But the hands and brain comprise an integrated learning/creating system that must be engaged in order to secure the passions and "heart" of our youth. It is the opportunity to be engaged through the hands that brings the seen and known to concrete reality in human experience. Without the opportunity to learn through the hands, the world remains abstract, and distant, and the passions for learning will not be engaged. When the passions ARE engaged and supportive systems (teachers, community resources, technology etc) are in place, students find no mountain is too high, and no concept too complex to withstand the assault of their sustained interest and attention. You don’t have to take my word for this. You can see it in action, and while I can describe my own observations, I know that you, the reader of this material can reflect on times when your passions have been engaged in your own lives and your own learning has been at its height. So what is the answer to the challenge of engaging the heart in education? Get real. Real life engages the intellect and the imagination. Crafts are an excellent way to bring the real world into the classroom. Real tools, real materials, real work, making real objects with real use. The purpose of the woodshop at Clear Spring is to help all the other subjects become real and engage the hearts and the passions or our students in education. You know what? It really works. Scissors, paper, string...the educational self-activities of Friedrich Froebel. It is interesting to me that when we have new students at Clear Spring, I can put paper and scissors in their hands, and they have very little idea what to do with them. 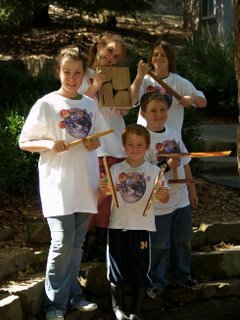 I began using a paper folding technique with students as a means of developing symmetrical designs for woodworking projects. I was very surprised to learn that instructions had to begin with the most basic concepts. "Align the corners so that they match perfectly, then hold them very tightly together while you move your other hand, pulling the paper smoothly until a tight crease is formed. While still holding the corners tightly together, move your hand down the length of the paper to extend the crease." And of course these words are not enough. They need to see a demonstration of the hand motions and then fold paper in their own hands to really get it. When I was a child, we cut out paper shapes with scissors, folded things, tied knots and made braided cords, did spool knitting and much more. 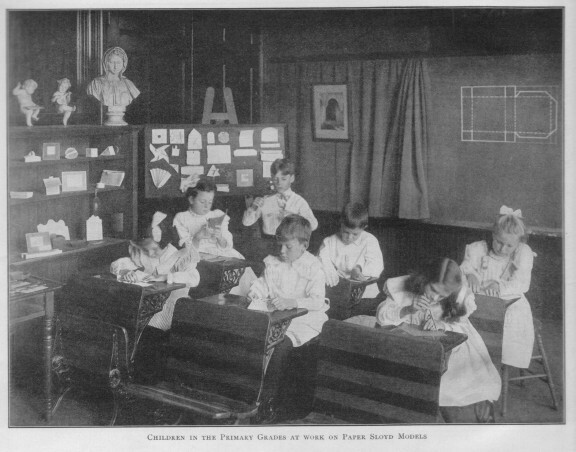 These were the "educational self-activities" suggested by Kindergarten founder, Friedrich Froebel, and the kinds of activities on which a lifetime interest in learning can be built. So where have these children been? You can watch the speed of their fingers on the keyboard, and you will know. Instead of folding paper, cutting with scissors, braiding and knots, their time is spent on computers. 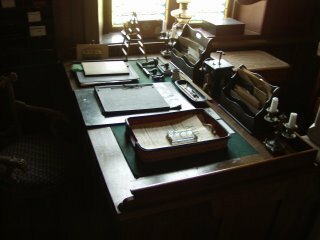 It is interesting that the world now is full of expert computer users that didn't start their computer use until middle age. Yet, these same middle aged computer users have become insistent that their children need to be introduced to computers at the earliest possible age fearing that they will be left behind in the march of technology. I'm sorry to report that we have become a sorry nation of idiots. Let children play. Let's stop shoving them into the future. Let's savor the moment with folded paper and braided string. It will do us a world of good. The photo above is from Edna Anne Rich's 1910 book, Paper Sloyd. It is interesting that the report below stresses the importance of playing with blocks. 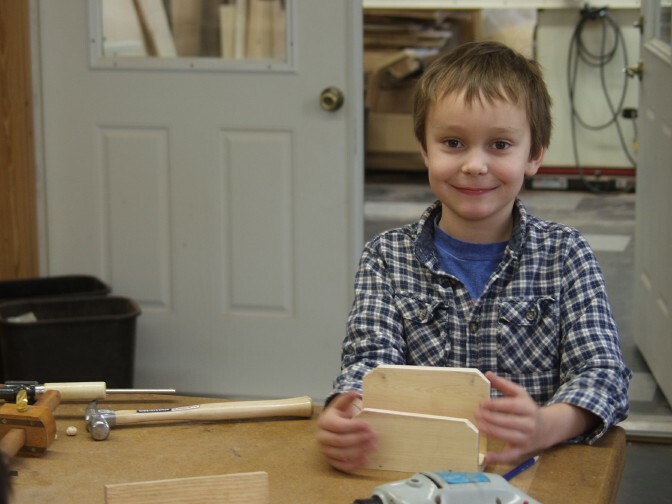 At Clear Spring, our first and second grade children not only play with blocks, they make their own in the woodshop. 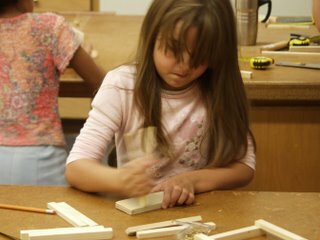 Many of our woodworking projects are inspired by the children's ideas, and when they wanted more blocks, they came to the woodshop and made them. The photo above shows how. As mentioned below, "play with blocks builds the foundation for mathematics, language skills, and spatial development.” Imagine the development that can come from blocks you've made yourself. They learned to measure, mark with squares, cut straight lines. They learned the importance of precision and attention. And they had fun. I would like to point out that you don't have to be someone as notable as Howard Gardner or Jane Healy to join the Alliance for Childhood's call to action. I did it. It is easy. Go to the Alliance for Childhood website from the links in the post below and at right. College Park, MD—Too little time for unstructured play leads to increased stress for children and parents, according to a new clinical report issued this week by the American Academy of Pediatrics. Nevertheless, many parents and policy makers continue to believe that pressuring young children to learn earlier and faster will help them succeed in school. In fact, it may have just the opposite effect. Experts say there is a serious disconnect between scientific knowledge of child development and popular ideas about how and when to introduce formal instruction, according to the nonprofit Alliance for Childhood. Parental pressure combined with flawed policies are among the reasons why creative play, long considered the foundation of the early childhood curriculum, is now disappearing from preschools and kindergartens, says Alliance President Joan Almon. A recent Public Agenda survey, for example, found a huge divergence of opinion between teachers and parents about the amount of testing children are subjected to: 71 percent of teachers think there are too many standardized tests, but only 17 percent of parents think so. Many experts in child development link the increased pressure on young children and the decline of play to later school failure. A “Call to Action on the Education of Young Children,” issued by the Alliance for Childhood and signed by more than 150 leading educators, physicians, and other experts, calls for a reversal of education policies that cut time for child-initiated play and emphasize formal instruction. “We are deeply concerned that current trends in early education, fueled by political pressure, are leading to an emphasis on unproven methods of academic instruction and unreliable standardized testing that can undermine learning and damage young children’s healthy development,” the Alliance statement says. “Preschool education must not follow the same path that has led kindergartens toward intense academic instruction with little or no time for child-initiated learning. If such practices were effective for five-year-olds, we would have seen better long-term results by now. The signers include Harvard professors Howard Gardner and Kathleen McCartney, pediatricians T. Berry Brazelton and Mel Levine, child psychiatrists Kyle Pruett, Alvin Poussaint, and Stanley Greenspan, MacArthur Award-winning educator Deborah Meier, and authors Jonathan Kozol and Daniel Goleman. The Alliance for Childhood Call to Action is posted, with a complete list of signers, at Alliance for Childhood.org. The American Academy of Pediatrics report on play can be downloaded here. We use a Japanese style pull saw with the elementary students at Clear Spring. The fine teeth make it easy to begin the cut. It is light weight and agressive, so the children can cut wood quickly. The Vaughan Bear saw is a bit stiffer than normal Japanese saws, so the blade won't bind or kink as easily and the blades can be removed from the handle and replaced periodically. We use bench-hooks to make repeat cuts to precise measurements. Clamp it in the vise, and then clamp a stop block in place to control the length of the parts. In the photo below, the student is checking the distance from the stop-block to the saw cut before putting the wood in place to be cut. The saw cuts in the front and back of the bench-hook guide accurate placement of the saw on the bench-hook and assure that the cut will be made square. Making a quick vise...to get started. 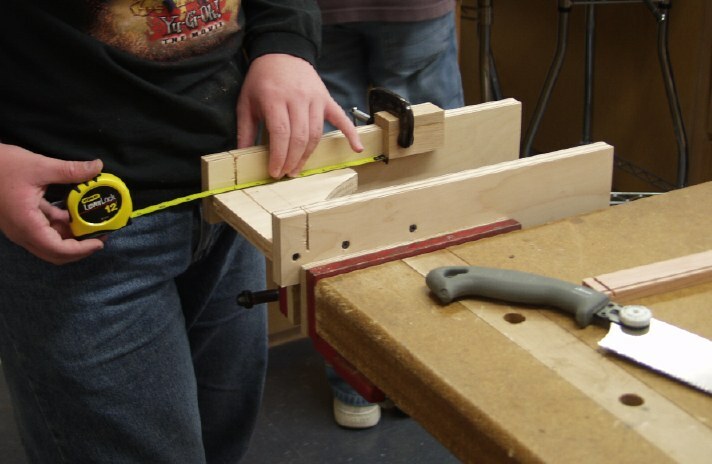 A real bench vise is the best way to securely hold stock for sawing or any number of woodworking operations, but a quick vise can be made using a common wood bodied hand-screw and a clamp to attach it to a bench or plank as shown in the photo above. This option might be enough to get you and your child safely started. You can also use long wood screws to attach the hand-screw to a saw horse and eliminate the need for the second clamp. 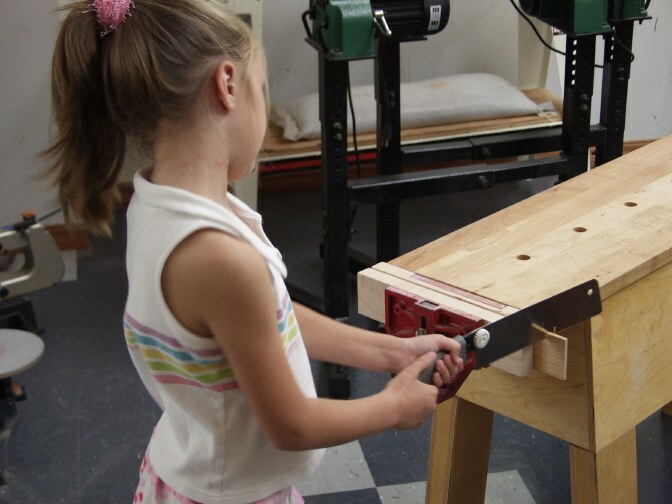 My own daughter began joining me in my woodshop at the age of 3. She would work quietly at a low bench using glue to assemble rather odd, but charming objects from the interesting shapes left in my scrap pile. It was always a joyful time for me, seeing the pleasure she took in the work and the pride she expressed for the finished objects. The other information I have shared in this blog should convince you that work with the hands is essential to the full development of your child's intelligence and should be an important part of his or her education. At this point, given the No Child Left Behind pressures on American schools, you will probably be mistaken in thinking your child's school will provide the kinds of activities required. Take matters into your own hands. Invite your children and grandchildren to your woodshop and invite them to discover their creative powers. 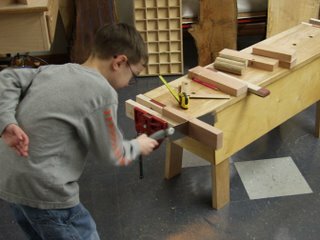 If you don't have a woodshop, buy a clamp, build a saw horse or bench and get busy. It will be fun for you as well. 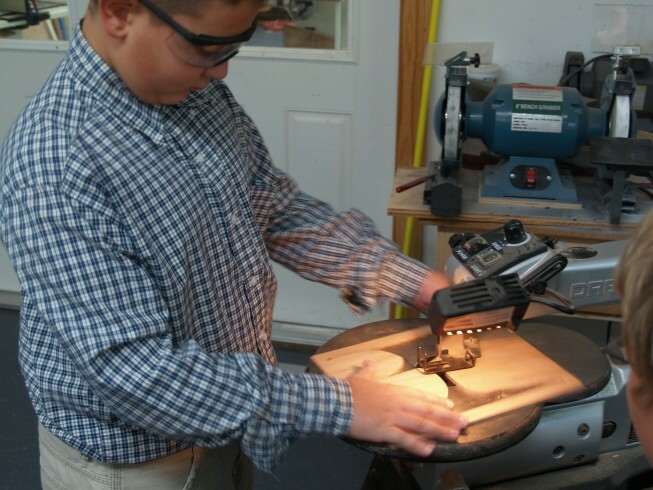 Woodshop safety...How to keep kids from hurting themselves. This is a common question and an extremely important concern. Working with first and second graders with sharp saws would seem contrary to common sense. But there are some rules that we use in the woodshop, and they are the same rules that apply to adult woodworking. 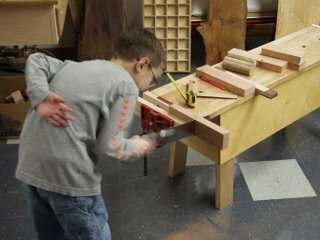 One is to use a vise or clamp to hold the wood that is being cut. Cutting with a saw or chisel in one hand and with the other hand holding the wood is an invitation to accidents, so at the Clear Spring woodshop, we use benches with woodworking vises to hold the wood secure. 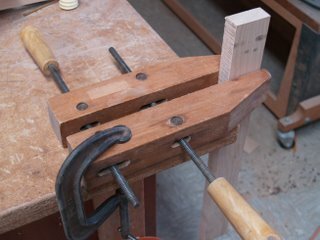 Tomorrow I'll show how to use two clamps in place of a vise if you are just starting out. Wyatt William in the photo above illustrates another important rule. Either both hands go on the saw, or if one hand offers enough strength, the other goes safely behind the back. 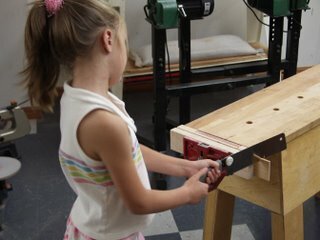 Crafts and woodworking in schools...It is extremely important that crafts be taught in school for a variety of reasons. Actual problem solving in real materials invites self-assessment. Crafts don't require the judgement of an external authority like a teacher to point out success or failure. Crafts allow learning to take on deeper meaning. Learning abstract concepts by stuffing in the brain is a sad substitute for knowing how to make something with your own hands. When you engage in training your hands in their creative capacity, lifelong learning becomes a meaningful concept and you realize that there are no external limits to your learning potential. To engage in the exercise of your own creative power provides insight into the beauty and inherent value of the objects treasured in our civilization. There are particular values inherent in woodworking as a tool in education. Unlike many crafts, woodworking requires measuring and geometry and is therefore useful for bringing abstract mathematics to concrete reality. Woodworking can require a degree of precision and accuracy that can lead to a focus on quality work. Woodworking requires the use of tools that were originally the foundation of modern civilization. These tools provide an excellent introduction to the expanding role of technology in our lives. Since nearly everything useful in human life was at one point made of wood, the possibilities of what to make and how to integrate woodworking into general education are unlimited. The greatest significance in woodworking becomes clear when you see the pride the students have in their finished work. The girl in the photo above told me proudly, "I still have everything I made last year in woodshop." Doing Sloyd...only one way to learn it...you do it. When I became familiar with the educational system, Sloyd, in which woodworking was used as a "formative" or developmental resource in general education, it was obvious that it needed to be tested in a modern school setting. 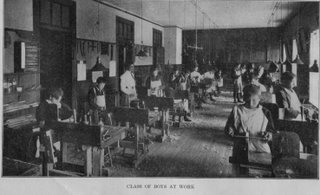 While the woodworking program at Clear Spring School is based on an educational philosophy shared with Sloyd, we do not make an effort to eactly duplicate the program designed in the 1880's. Consistent with Otto Salomon's advice, the projects and curricula at Clear Spring School are adjusted to best meet the needs of our children and their learning environment. 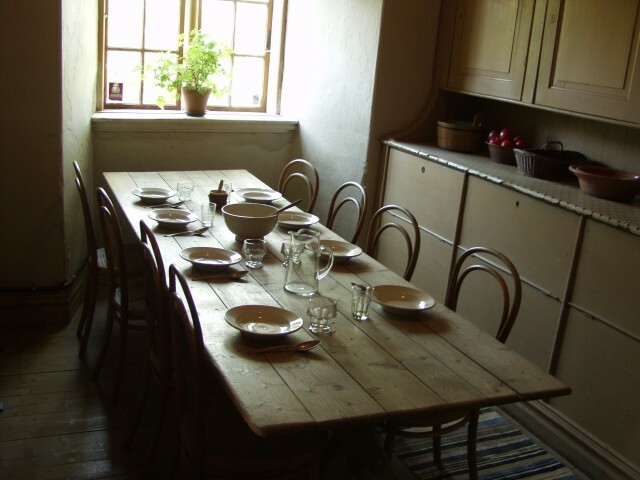 There are a number of basic sloyd projects that have been useful, however, for getting immersed in Sloyd as an educational concept, and because the projects provide objects of use and beauty in the classroom and home. Every other year with our first and second graders, we make pencil sharpeners. This was written up and published as an article in Woodwork Magazine number 94 in August 2005. It can be downloaded from my website with this link. The two photos above and below were taken in yesterday's lesson. In Educational Sloyd Otto Salomon suggested that in learning, students should move from the concrete to the abstract. In my experience, education needs to move constantly back and forth between the two. What we learn from books and from the presentation of theoretical material needs to be measured against reality, and direct experience is always required to temper and gauge the validity of the hypothetical. In learning Sloyd and its value as a teaching tool, there is no substitute for the time spent with children in the classrom. Today's news is a horror story. Unbelievable. Pent-up rage delivered upon the innocent in a one-room schoolhouse and yet, the killings in Pennsylvania are only part of the story in the last few weeks of anger and violence in American Schools. Obviously, the problems in American society are unfathomable and immense. We all take some comfort in our own isolation from such things. Pennsylvania is a long ways from Arkansas, right? But if such things can happen in an Amish one-room schoolhouse, where can anyone feel safe? As a small experiment, please take your right hand and run your fingers lightly across the keyboard or across the fabric of your clothes. You will get an immediate grasp of the sensing power of your fingers and hands. Now hold your hand in front of you and examine it. What you see before you is the incredible creative power of humanity. It makes music, writes in cursive, writes poetry, and crafts beautiful objects that can tell the story of loving involvement in human life for generations to come. Now, one by one, roll each finger in toward the palm. When they touch, clench them tight and roll your thumb across over the tips. This is what you get when you neglect and ignore the sensing and creative power of the human hand. We've been doing this for generations, attempting to solve problems through the deployment of clenched senseless objects. It is a very sad day. I know it seems grossly opportunistic to make a point about the need for crafts and the arts in schools from the tragic circumstances of yesterday's events. Forgive me, but the cause is real and we live with choices we have made. Is your hand still tight in a fist? Let it loose now and do something creative with your day. Otto Salomon, the founder of Educational Sloyd was an incredible scholar. He lectured regularly in Swedish, German, English and French, and carried out correspondence in all these languages with students from throughout the world. In addition, he was a serious student of various educational theorists and wrote books in Swedish in which their contributions were discussed. At its heart, he insisted that Educational Sloyd must be based on sound pedagogical theory and experience. In synthesis of his studies, Salomon outlined principles that transcend the teaching of crafts and could be broadly applied throughout general education. His simple principles were that instruction should move gradually: from the known to the unknown, from the easy to the more difficult, from the simple to the more complex, and from the concrete to the abstract. In addition, he believed that the products made in Sloyd should be practical in nature and build a positive relationship between home and school. These are the principles we try to follow in the planning of the Wisdom of the Hands program activities. These simple principles could provide the foundation for a revolution in American education. But there is a challenge that would need to be overcome first. Each teacher would need to have direct knowledge of each child’s current understanding and experience in order to plan the next lesson as well as time available to give individualized attention to each child when required. Imagine a classroom of twenty-five or thirty students. In such classrooms, it is extremely difficult to give any individual attention to children learning either faster or slower than the selected rate. In fact, it is often difficult for a teacher under such circumstances to even know his or her children well enough to plan for their learning needs. So, two changes must be made. One is to reduce class size, and the second is to provide to teachers the opportunity to have multiyear experience with each child. Sadly, schools haven’t made significant progress in lifting literacy rates since the days of the one room schoolhouse. In 1850’s America, literacy was almost universal amongst free individuals. In classrooms of those times, a single teacher would have the same students for several years, getting well acquainted with the varying levels of individual advancement, and a single student, whether faster or slower in learning rate, would find lessons offered that would be appropriate to his or her needs. The one room schoolhouse may not be a practical option today. In fact, our idealized view of it may be unreasonable, but the learning experience and effectiveness at Clear Spring comes close to the one room school house of our finest dreams. At Clear Spring, students move through classes in a two-year cycle. First and second grades are grouped together in a single classroom, and the same two year divisions are made in subsequent years. A teacher will have a student for 2 years with the class sized limited to 14. The teacher in such circumstances becomes well aware of individual learning needs and is better able to shape lessons to meet the learning needs of specific children without limiting the natural advancement of others. If we were ever as a society to make the decision that schools would be the place to truly educate students rather than just confine them, bore them and keep them off the streets, Clear Spring would be the model of choice. Hands-on, hearts-engaged, small classes, with multiyear engagement of teachers in the lives of their children. It is a clear formula for student success.